Cook bacon at medium-high heat until fat is rendered. Add shallots and saute. Add arugula and wilt. Season, remove from heat, and cover. Season and sear scallops at high heat in cast iron pan for 1-1 1/2 minutes per side. 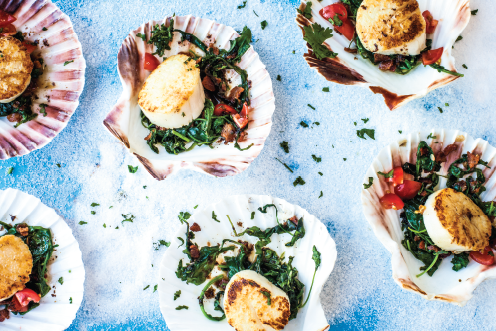 Place the arugula on a plate with the scallop on top, scatter the cherry tomatoes around the dish and enjoy! At De La Mer, our goal is to bring people the freshest and highest quality seafood from around the world. We offer a large selection of organic, naturally raised, sustainably caught, and farmed fresh seafood and fish options.